In the 1940’s and 50’s, when the weather was too cold to work in Ohio, Willo’dell expanded to Florida and did a lot of estate work. Moving large camellias was Mr. Quinn’s passion! We even did much of the original work at Cypress Gardens as well as extravagant exterior scapes in notable restaurants in the Tampa area. Dan and Maxcine Quinn, the founders of the company, had a colorful background and established close ties with author, Louis Bromfield, developer of Malabar Farm. They even attended the wedding of Humphry Bogart and Lauren Bacall at “The Farm”. All of Mr. Bromfield’s designs and plantings were created by Willo’Dell which is why we are mentioned in some of his books. With a few employees, a pickup truck, a tree mover, and two mules (Pat and George), the original work was completed mainly by hand. Today we depend heavily on the latest equipment to improve productivity and professionalism of installation. In 1969 Mr. Quinn’s son, Dan, took over the reins of the company. In 1977, a second garden center was opened in Wooster to better serve our many customers in that area. In 1991 our recycling facility was established, allowing the production of our own plant material. The recycling center also serves Ashland and Richland Counties as a collection point to recycle commercial and residential yard waste. Willo’Dell constantly does our part to save the environment. In 1997 a century old barn, which had been moved from across the road in the 1940’s, was remodeled into our magnificent gift barn. Later a greenhouse was added to the barn, as well as a conference center where we provide educational speakers for interested groups. We recently purchased a farm on 603 where we produce nearly all of our larger trees. We continuously grow the newest varieties of plants and provide the largest number of proven-winner shrubs in the area. If you are looking for the latest in new species of plants, save yourself some time and come to Willo’Dell first! of unusual trees, including many varieties of Japanese maples, and a large fruit tree display garden. Leave the stress of everyday life and enjoy the constantly changing Willo’Dell experience. All of this growth has been due to our dedicated and talented employees, many of whom have been with the company for more than 20 years. 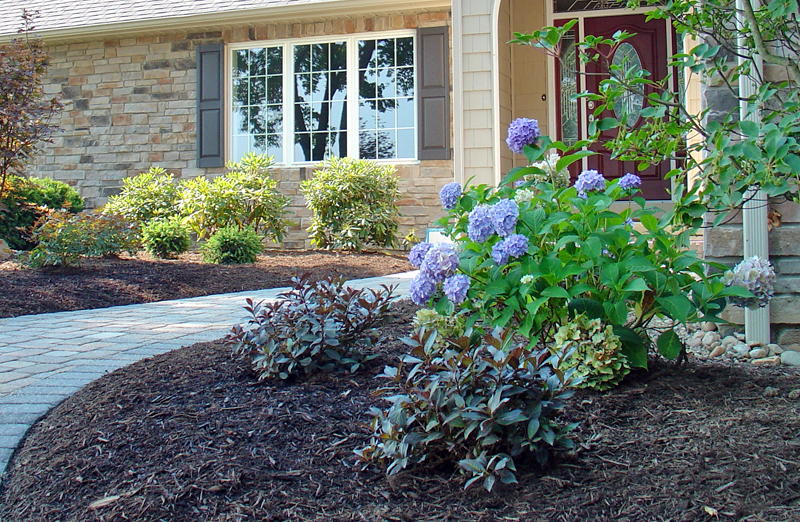 Our landscape construction crews service an area with a radius of about 100 miles from our Ashland location. We strive for excellence in both commercial as well as residential installations. Call or come see Paul Frederick, Vice President in charge of design and sales and take advantage of his 25 years of experience with Willo’Dell, making the area a more beautiful place to live. We look forward to being your exterior decorator soon.